Another Beautiful Sunday in Paradise. 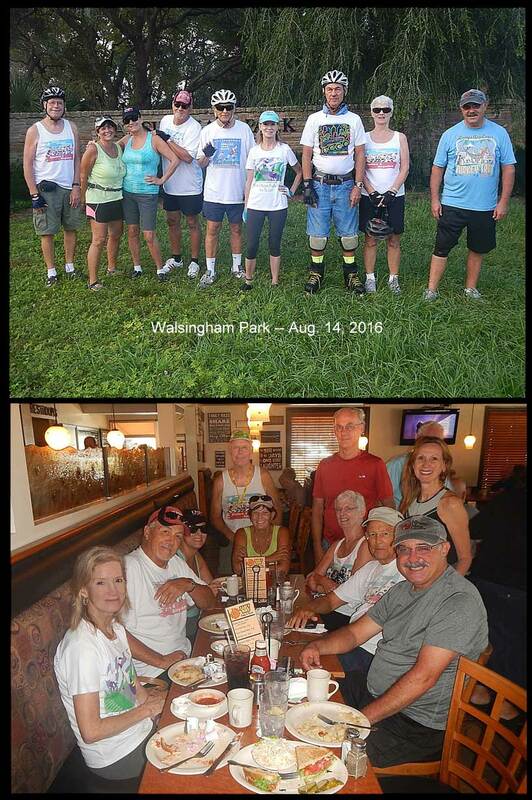 Bladers/Bicyclers (left) Bruce M, Carol K, Ginnie S, Rick P, Steve G, Dorey Anne, Jeff B, Carol J and Rob H came. Welcome all. We decided to do our usual route and go one lap through the Botanical Gardens and two more laps just around in Walsingham Park. The weather was very nice when we started and one would almost say it was a little cool. However as we did more laps it became more like summer. We had 1 blader and 8 bicyclers. Most everyone did the 3 laps for 11 miles. We Brunched at the Savory restaurant as planned. Jeff went ahead and reserved us a table so we just came in and sat down at our table. Thanks Jeff. Debra D joined us at the restaurant. Welcome Deb. Our service was good, the coffee flowed freely and the food very good as usual. Forgot to get everyone's rating but I would give Savory's a 9.6.